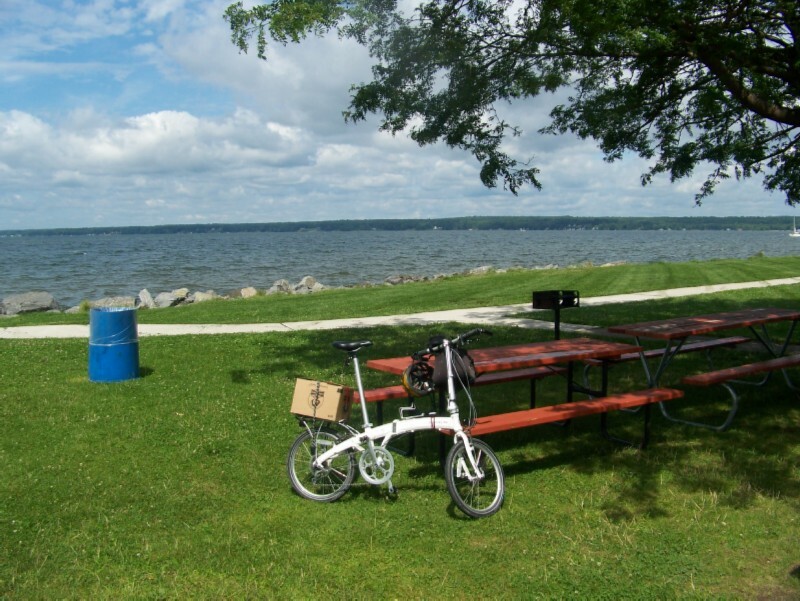 The next segment consisted of stretches on the Old Erie Canal path and a detour to Lake Oneida for a layover day. 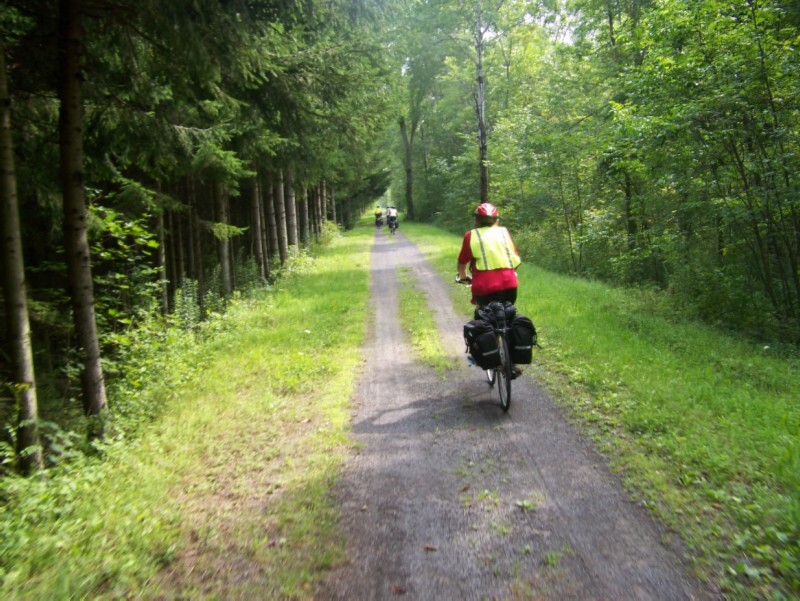 We rode the path from its western terminus in Dewitt to Canastota, where we used back roads to get to Verona Beach. 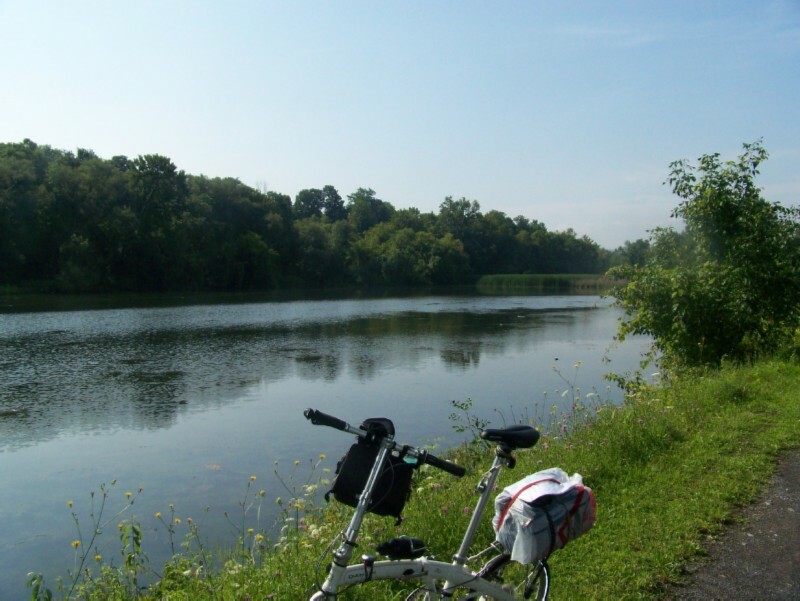 Our route from Canastota to Verona Beach and back to the Old Erie Canal path at Higgensville is shown here. The design quality of the Old Erie Canal path comes no where near that of the Erie Canal Heritage Trail. The latter was much wider, had plenty of packed stone dust (pea gravel in non-NY jargon), and it tapered off to the sides to allow for water drainage. 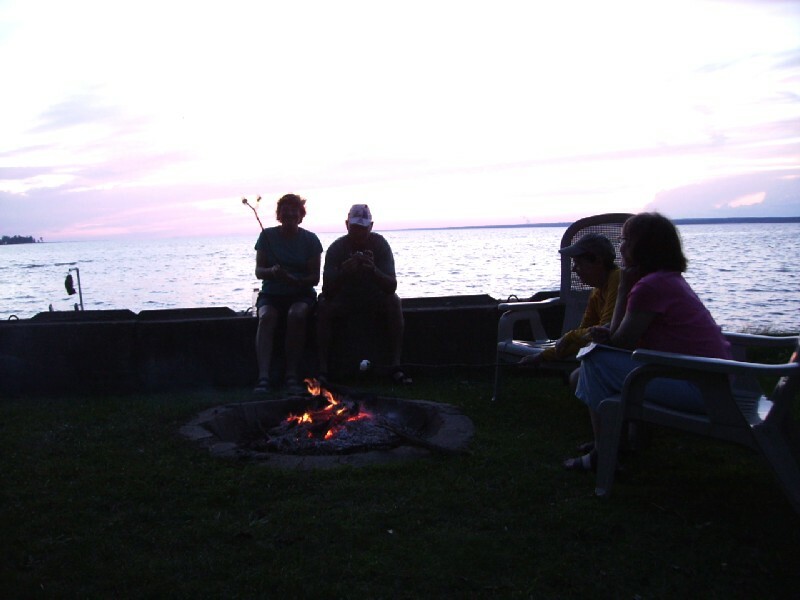 The Old Erie was more like a trench cut in the grass. We had had heavy rain the night before; and there were many puddles covering the width of the path, especially where the stone dust had disappeared. Where these bare spots weren't covered with water, it was like riding in slippery red clay. Fortunately, the grass to the side was solid and provided an alternative to splashing through the puddles. At times the trail became a double track, or even single track. WEATHER 80, humid, thunderstorms forecasted. 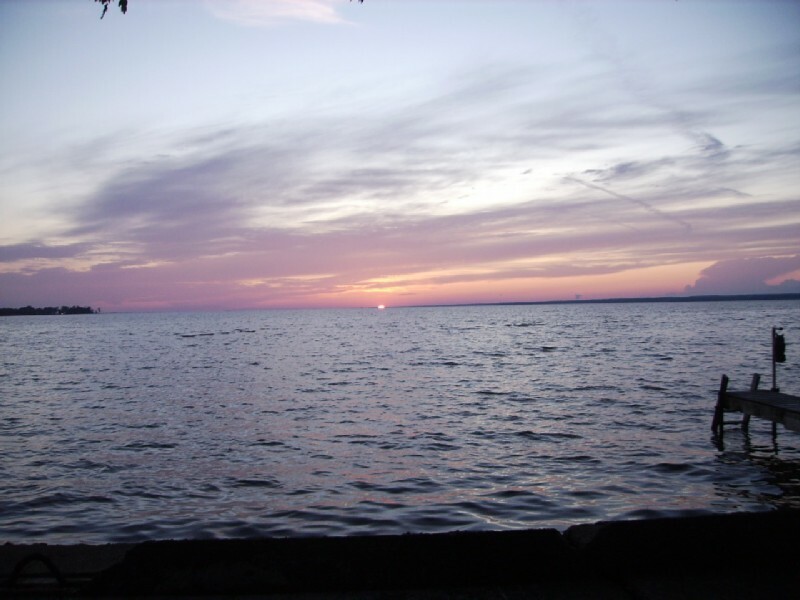 August 10: Dewitt to Verona Beach; MILEAGE 28, lodging Lakeshore Motel. 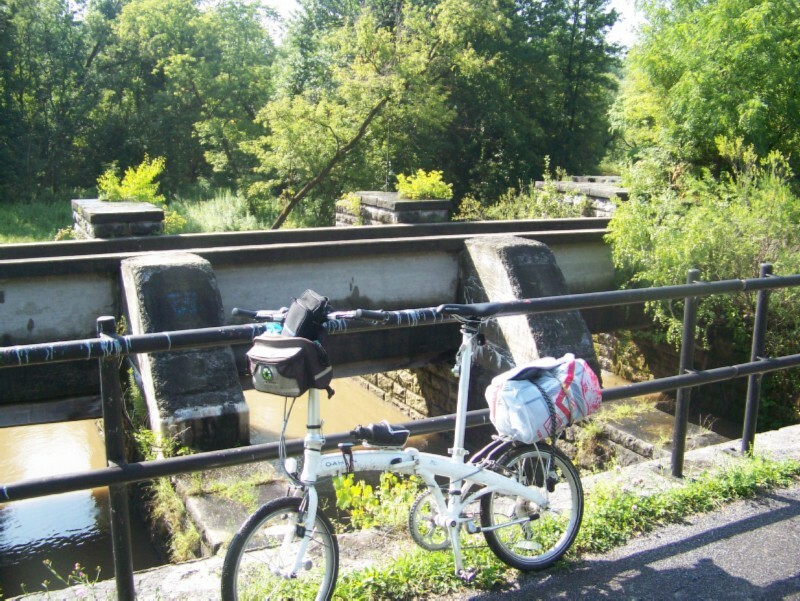 Butternut Creek Aqueduct at the west end of the Old Erie Canal path. Wide spot in the Old Erie Canal. In general the Old Erie Canal is much narrower than the later Barge Canal that we followed in a earlier segment. Because of the condition of the path, some of us detoured onto the road near Bolivar. It soon took us into Chittenango, where we stopped briefly at the canal museum there. We eventually caught up with the rest of the group at Canastota, where they had discovered ice cream novelties at a small "mom & pop" convience-like store. We saw several of these along the way. I thought they had gone the way of general stores and dime stores; at least I had not seen any in other parts of the country. After a rest and crossing the NYS Throughway, we continued on to Lake Oneida on pleasant country roads. 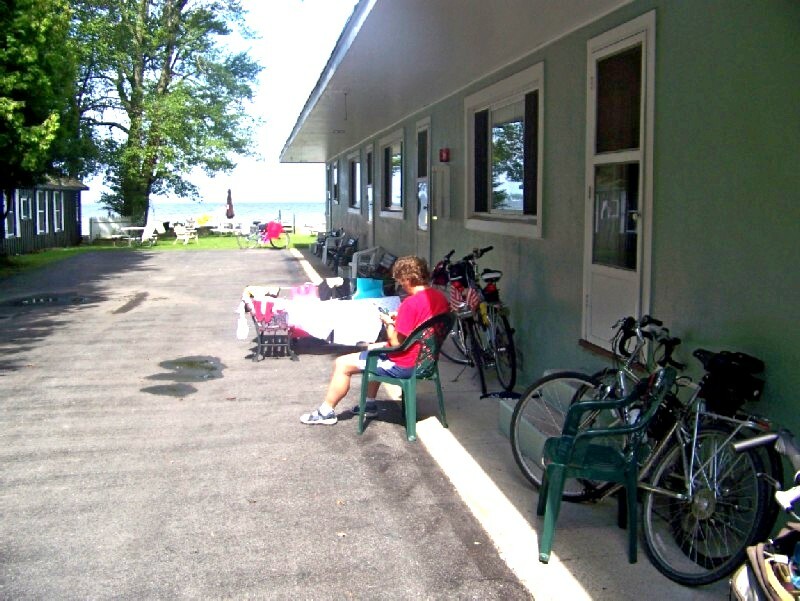 The first thing we did when we arrived at the Lakeshore Motel was to hose down our bikes to get rid of grit from the wet path, and lubricate the chains. 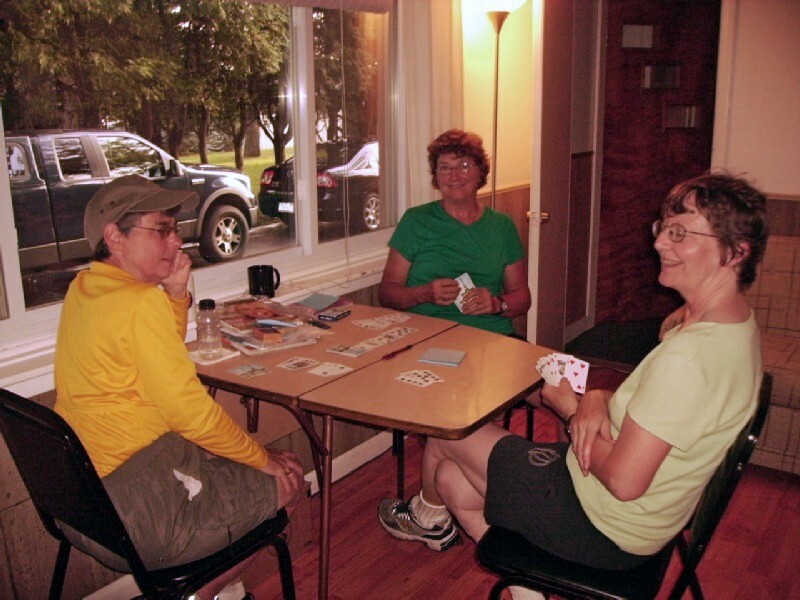 A game of cards at the Lakeshore Motel in Verona Beach. This turned out to be an ideal choice for our layover day. 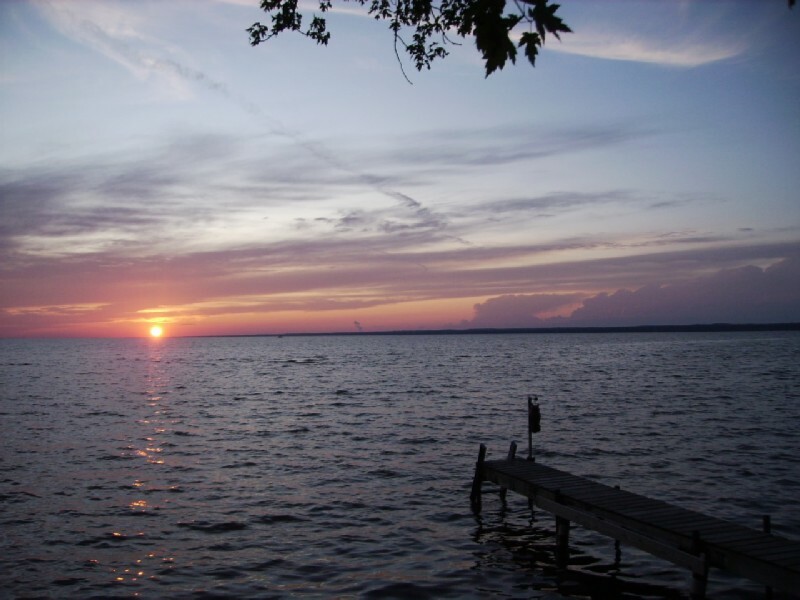 It was situated directly on Lake Oneida along a quiet street. We had two connected appartments, one with two bedrooms, a bathrooms, and a living room; the other had a kitchen in place of the second bedroom. NOTE: the bedrooms were very small. Chinese laundry at Lakeshore Motel, Verona Beach. I had been contemplating riding the two miles into Sylvan Beach to purchase raw materials for breakfast, all the while noticing dark clouds and lightening to the south. I decided to go for it; and just as I was coming out of the store I felt a few drops. I believe the Mu P8 traveled the two miles back to the motel faster than it ever had under pedal power; and I got back just before the sky opened up. 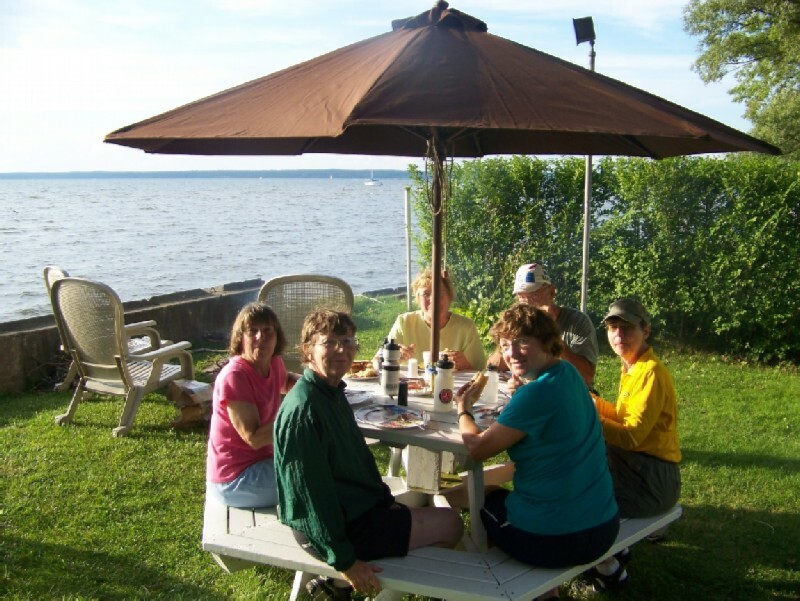 It had stopped raining by supper time; and we chose Gary's, a very nice restaurant overlooking the lake only a block from the motel. There was another downpout while we were eating; but it had stopped by the time we were ready to walk back. This seemed to be the pattern: rain, but we never got wet. 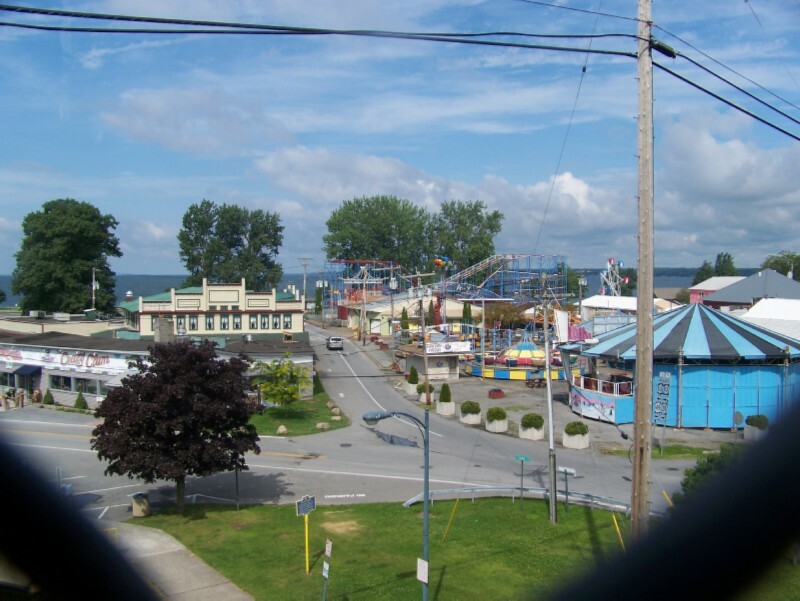 Old time amusement park in Sylvan Beach, viewed from the bridge over the Barge Canal between Verona Beach and Sylvan Beach. Reluctantly we said good by to Lake Oneida and the Lakshore Motel, making our way on quiet country roads back to the Old Erie Canal path near Higgensville. The path was more or less like we left it at Canastota, double and single track, except the puddles had dried up and the bares spots were solid, making for much better riding. At the end of the path, a half mile detour on a quiet road took us to Lock 21 on the Barge Canal where we watched a pleasure boat being locked through. 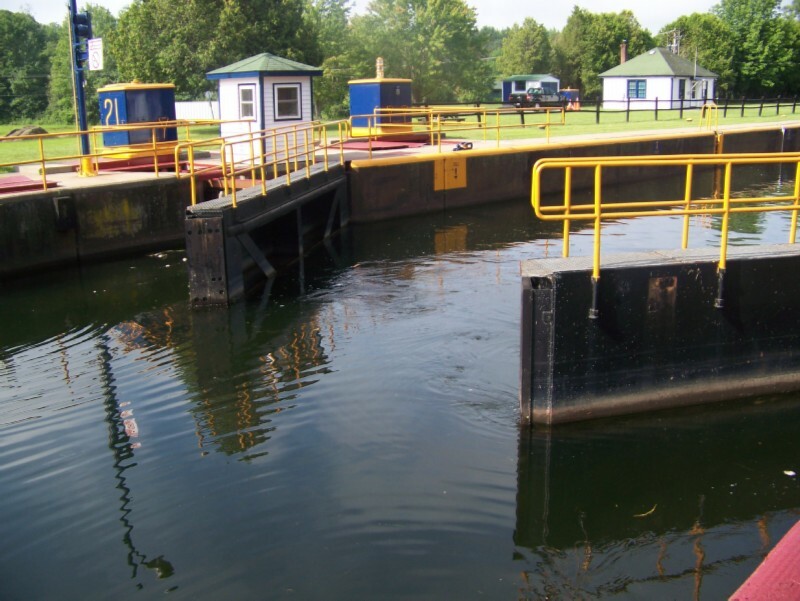 Gate opens to allow a boat enter from the direction of Lake Oneida. 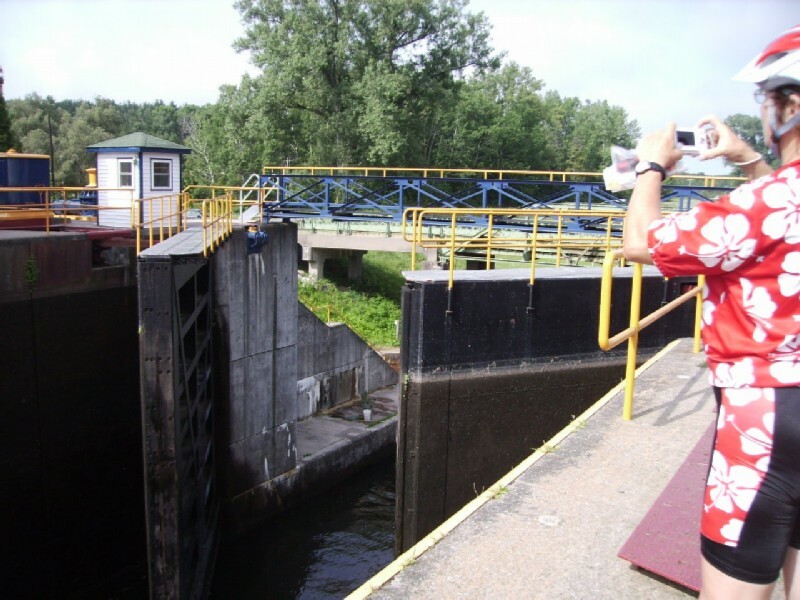 Boat enters lock at low water level. 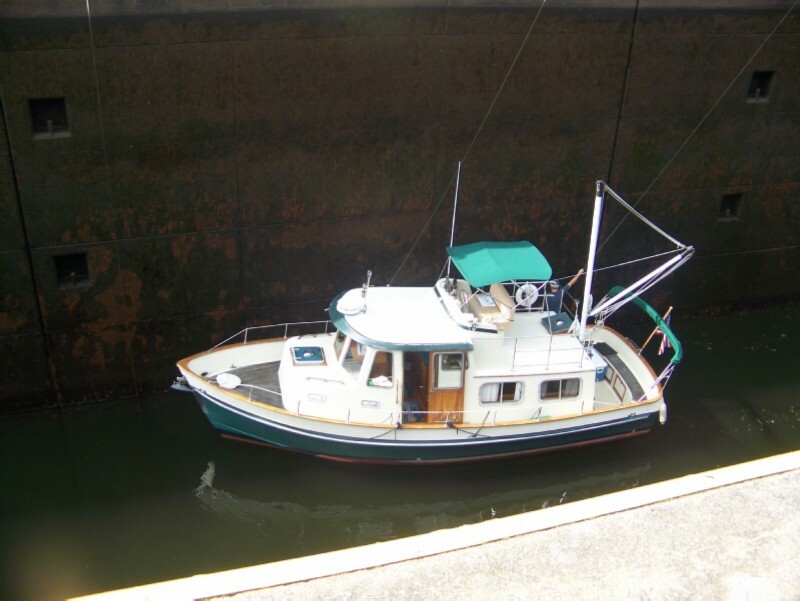 It looked like a fishing boat converted to a cabin cruiser. 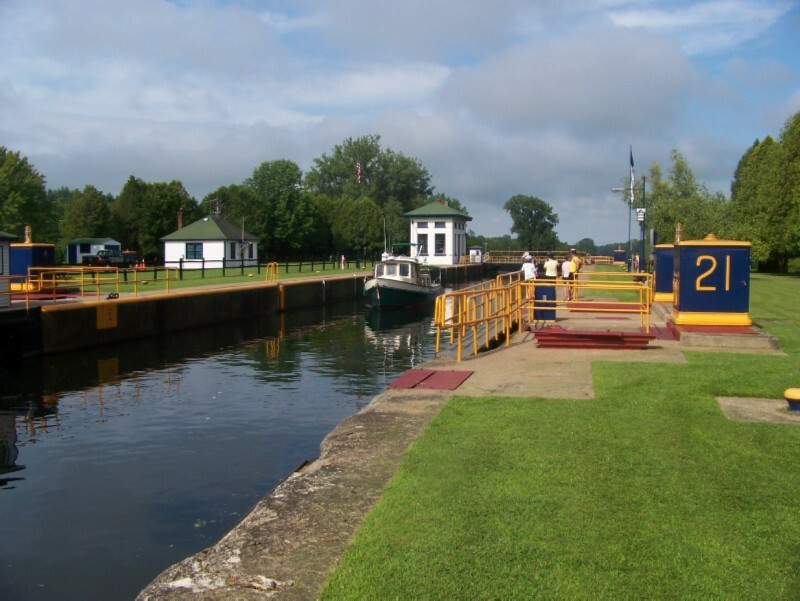 Note ropes anchoring boat to top of lock. Boat gets underway after being raised to the top. Gates are open to allow boat to exit in the direction of Rome. Back on the Old Erie Canal Path between Lock 21 and Erie Canal Village near Rome. The path here is somewhat better than west of Lock 21. We may actually be riding along the Barge Canal. If you go all the way to the end of the path at the Erie Canal Village, the only way to continue seemed to be to turn left between the Rome Sports Hall of Fame building and Erie Canal Village to the parking lot along the road. There were rest rooms behind the Hall of Fame. An asphalt path not on any maps I came across took us from the end of the parking lot to the intersection of Routes 49 and 69 at the outskirts of Rome. There we were dumped from the bike trail into a standard American "road town". I recommend taking the much more pleasant route through Rome shown here.